Knowledge – a good leader should know.. The working environment, business, key players etc.. Skills – a good leader should be able to.. Attitude – a good leader should be ..
ASTD ICE 2012 promises to be THE event for the learning community. Over 4 days, with hundreds of educational sessions, the International Conference and Exhibition is a fine opportunity to get up-to-speed on the learning world. Having seen the agenda, I know what’s on offer.But what do people want? What is MY network looking for? What are the hot topics? Over the past few weeks, I asked that question within my network and got replies from 45 professionals from the L+D world, ranging from Learning Managers in international corporations to freelance one-man-consultants like myself. 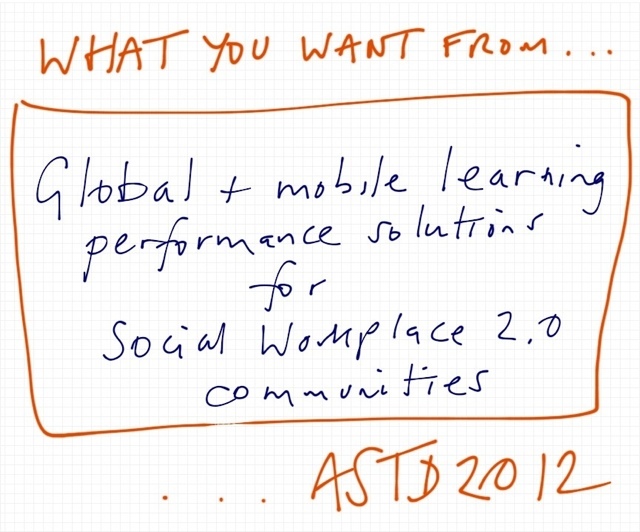 Answers came in via Twitter, LinkedIn (including ASTDs virtual global village), email and face-to-face. We live in a global marketplace. Even if we don’t do business globally, we can pull in learning from anywhere and push it out just as easily. The ability to do this “at the speed of business” (@charlesjennings) and on-the-move increases performance and efficiency. From a wandering salesman to a home-working consultant, the need to get learning on-the-go is becoming more and more important. As said enough already, learning does not equal training and training does not equal learning. Learning professionals must create performance enhancement solutions. Learning happens in rooms, on the web, in and out of the work flow and we need to be the “guide-on-the-side” (@C4LPT) that recognises, facilitates and supports the real-time need for enhanced performance results. More than ever, learning must be practically geared towards business results and actually get things done. There is a lot of buzz in the learning world about the “New World of Work” in which we live. In part, this is the fruit of the global and mobile world I already mentioned. And it implies a cultural shift that is affecting learning. Traditional top-down learning solutions are still good in many moments, but other learning approaches may be more in tune with our working preferences. In the Kluwer Indicator 2011, we saw that employees learn most from their colleagues. The social workplace learns quicker than its non-social predecessor. It learns together. Examples like BT’s Dare-to-Share program that incorporate social media platforms to make peer-learning and quick and easy solution are becoming day-to-day. 2.0 signifies the process of “upgrade”. Regardless of what level the people in my network at currently operating at, everyone is conscious of the need to upgrade their working methods and approaches to learning. Continually. 2.0 is not seen as simply “the next version” but as the “upgrade mentality”. Learning professionals do want to know what the new hot topics are and what is trendy, but they also want to know how to always stay on top of their game, creating flexible changeable learning solutions that can deal with every tomorrow. The community mentality is again linked to the social workplace and it’s mentality. It’s also linked to functions, needs, platforms. A community can be defined as a wide group of people with similar needs, functions and missions. They may or may not be working in the same company, but they share a common motivation. They may work in proximity. They might just get together from time-to-time like the HRMeetUp guys to create personal learning networks, share best practices and ask questions to other community members. Learning professionals can help to build the community spirit, bring people together, provide community tools and learning opportunities. Follow me and my sponsor Kluwer for an update and I’ll see you there! At a recent Kluwer Trainer’s Evening, we discussed lots of things that could be done using #SoMe before, during and after training to improve its effectiveness. I decided I would try using video to invite people to training, giving a little information about myself and the content prior to arrival. I thought this might simply help to create some rapport prior to an event and maybe align expectations. I also think the medium is nicer than a simple email. This film was made in my office at home using a flip-cam. I decided to pay real preparation attention to the content of what I wanted to share, but the film itself was done in 1 take –> I don’t think people expect you to be a perfect presenter on such a film. The film was referenced in an email to all participants – 70 people in total. It was watched by 60 people so far. If you, as a traine, have questions about such simple add-ons to yor approach, mail me!